The Dublin Corporate Area Plan (DCAP) was adopted as part of the Dublin Community Plan in September 2018 and provides guidance for future development and redevelopment. 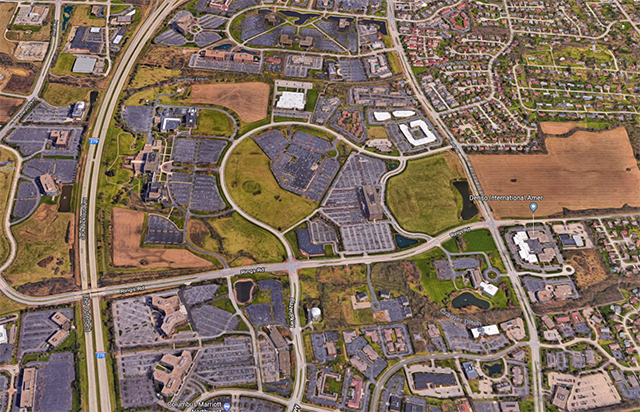 The DCAP area is approximately 1,000 acres and includes all legacy office parks within the Metro Office, Blazer Research, and Emerald Corporate business districts and the Frantz Road corridor. This study was initiated in 2015 with public engagement and input in 2016, 2017, 2018, and ongoing into 2019. The intent of the DCAP is to encourage and facilitate new investment and redevelopment of commercial properties in the planning area, as these business districts have and will continue to serve as a key corporate base for the City of Dublin. Encourage a variety of land uses, focusing on needed amenities to serve workers, nearby hotel visitors, and residents. Apply placemaking principles to encourage vitality within the district. Use formal and informal open spaces as organizational and focal elements for new development and redevelopment. Support integrated infill residential development at key locations in support of office development. Mitigate negative impacts of new development on adjacent neighborhoods. Position the planning area as a well-connected district (both walkable and bikeable) with service and recreational amenities (open spaces) to facilitate opportunities for community interaction. The City of Dublin has and continues to take the initiative to respond to, seek balance between, and pursue desired amenities among residents and our corporate base. A first example of this effort is the Frantz Road/Rings Road Neighborhood Commercial Development. Through a collaborative process involving residents, land/building owners, businesses, and the developer team, this project is expected to implement some of the key recommendations of the DCAP and begin providing the critically needed amenities to serve the immediate area. The City of Dublin initiated an RFQ (Request for Qualifications) process in May 2018 to identify a developer to collaborate with on the development of the 10 acres of City-owned land on the west side of Frantz Road, north of Rings Road, and south of Blazer Parkway. 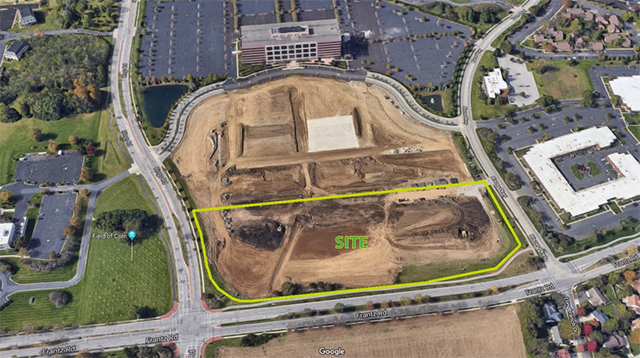 The site is a 10-acre residual from the 23.7-acre parcel that the City acquired in 2016, of which 13 acres were developed with a parking lot and stormwater ponds as part of an Economic Development Agreement with Cardinal Health. The Daimler Group responded to the RFQ, with a developer team that includes Bean Architects, POD Design, and EMH&T. Staff and the Daimler Group hosted a public meeting on Tuesday, November 27, 2018 at the Dublin Community Recreation Center to introduce the Daimler team and the project objectives. Approximately 50 stakeholders attended the meeting, which included a brief presentation by Staff to introduce the project, its objectives, and its goal of implementing the recommendations of the Dublin Corporate Area Plan. Staff introduced the Daimler Group, who presented initial concepts regarding possible land uses and architectural character. After the presentations and Q&A, the meeting transitioned to an open house where attendees were invited to talk with Staff and the developer team and view presentation boards with conceptual land uses, architectural character images, and ideas for open space/streetscape treatment. Attendees were also asked to provide feedback using green dot stickers to vote on images/aspects of the concepts that they liked, and red dots to indicate dislike. City Staff has been working with the Daimler team to prepare a development proposal that reflects the stakeholder feedback collected at the November 27 meeting. More input from the community is necessary. The City will continue to engage residents. Please contact Rachel Ray, AICP, Economic Development Administrator, at 614.410.4630 or rray@dublin.oh.us with additional questions or comments. Shifting office and employment demographics are re-shaping suburbs and urban areas. Dublin has defined itself as a premier employment center in the Columbus region since the 1980s. Business retention and attraction is vital to our community’s corporate income tax base which funds City services, quality infrastructure and community amenities. 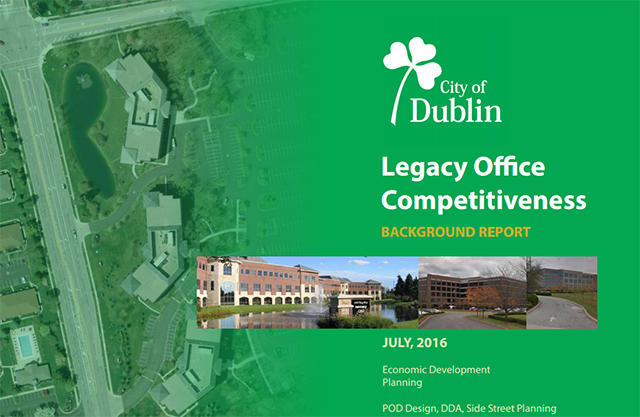 To remain competitive, the City of Dublin’s Economic Development and Planning teams have been studying the existing conditions, market conditions, stakeholder requirements, and effects of the changing work space demands on older suburban office complexes – legacy office spaces in older office parks like Metro Place. The study area is approximately 1,000 acres and includes all legacy office parks within the Metro, Blazer, and Emerald business districts and the Frantz Road corridor. This study was initiated in 2015 with public engagement and input in 2016, 2017 and continuing into 2018. Join us to review the updates to the Draft Plan. The City’s Planning team will be available to answer questions regarding updates to the Plan. What is the Dublin Corporate Area Plan? One of the underpinnings of this planning process has been engagement with two key constituencies: the employees who work in the planning area and the residents who live in the adjacent neighborhoods. A variety of outreach efforts have been undertaken that has provided us with a rich amount of input, which has shaped the final policies in this plan. An office competitive study was initiated in 2015. The information for this initial phase is available in this brief summary report – Legacy Office Competitiveness Background Report (PDF). This Phase I study serves as a launching point for the more detailed Dublin Corporate Area Plan study underway. A shift in the perceived and actual parking demand for some businesses that now utilize a much higher employee per square foot ratio than in the past. The consistently increasing employee desire for nearby convenience and entertainment amenities, ideally within a walking distance. The current homogenous, non-walkable/car-centric office development pattern in the City of Dublin has a direct impact on the ability to lease office space, as well as leasing rates. Today employees expect to be able to walk to lunch, fitness centers and other services. And they expect them to be open after work. The challenge for outdated office parks is to find the space for such uses, as well as the facilities that support walking, biking and transit connectivity. For example, Frantz Road is an important north-south corridor with older offices along the west side including a diverse range of businesses, and residential neighborhoods along the east side. The corridor currently lacks a number of amenities that would serve businesses and neighborhoods within walking distance. It is also a challenging corridor for pedestrians with landscaping barriers that are no longer valuable or relevant. The consultant team for this project includes POD design, Side Street Planning, and DDA advisors.